ntsocialism. 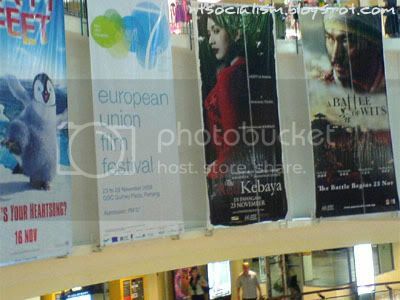 : 7th European Film Festival 2006. 7th European Film Festival 2006. Foreign film aficionados beware! Your wallets have been forewarned! In two days' time, Penang's Golden Screen Cinemas in Gurney Plaza kicks off its 7th EUROPEAN FILM FESTIVAL boasting several critically-acclaimed films such as 'Bast i Sverige! (We Can Be Heroes! )', 'Soldados de Salamina', 'De Gronne Slagtere (The Green Butchers)', 'Grabben i graven bredvid (The Guy in the Grave Next Door)' and 'Millions'. The festival will be commencing as the second leg - the first was held in Kuala Lumpur). Films will be screened in GSC Gurney Plaza from November 23-29, 2006. All films with the exception of Spanish movies will be at RM5. Spanish movies are FOC. View the film schedule here. The best of European cinema will be showcased in Malaysia during the European Union Film Festival (EUFF) which takes place this year from 9 to 29 November in Kuala Lumpur and Penang. The annual event is organized by EU Embassies in Malaysia and Delegation of the European Commission, and jointly presented by GSC. This year's film festival will be spearheaded by Finland, in conjunction with their presidency of the EU for the second half of 2006. At a press conference held today, Dr. Jaakko Lehtovirta, Counsellor at the Embassy of Finland, said: "This annual event provides, this year again, the European Union member states with an unique opportunity to showcase their film industries that don't usually get much visibility in Malaysia. Through our partner, Golden Screen Cinemas, we can reach the widest audience in Klang Valley and Penang." "The films selected this year represent European cinema in all its colours and styles." He added: "European films are typically seen as very artistic, and this is perhaps true, but the stories are often realistic, and so are the main characters. In Europe, we seldom refer to a "hero" of the film, as the characters are much more multidimensional. There are seldom clearly "bad guys" or "good guys". No doubt this makes the films more challenging for the viewer, but also more rewarding." Ms. Tan Gaik Lian, Marketing Manager of Golden Screen Cinemas Sdn Bhd said: "We are proud and delighted to be the official venue of the European Union Film Festival once again. It is through lasting partnerships with the likes of the 2006 European Film Festival which offers the discerning Malaysian movie buffs a wider selection of non-mainstream, art house and foreign language movies that GSC has maintained its position as the leading cinema chain." She added "Thanks to this festival, Malaysian viewers can take this golden opportunity to catch multi- award winning films." Tickets for the films in the festival are priced at RM5 each, with the exception of the two Spanish movies 'Saldados de Salmina' and 'El perro des Hortelano', which can be seen for free. Tickets can be purchased at GSC Box Offices of participating cinemas. Tickets can also be booked online at www.gsc.com.my or by calling the GSC ticketing hotlines in Kuala Lumpur at 03 8312 3456 or Penang at 04 222 3456. For show times, check GSC cinema listings in the local dailies, call the ticketing hotline or visit www.gsc.com.my. Official media partners for the 7th European Union Film Festival are KLUE Magazine and Light & Easy. The main sponsor of the festival is FINNAIR, our co-sponsors are the Regent Hotel, Klue Magazine, Melia Hotel and Light & Easy and the participating sponsor is Robert Bosch (Penang) Sdn Bhd.